Most widely distributed news in conventional media about IIMs probably is the highest/average salaries at the end of campus placements.On a different note , not sure why the media shies away from posting similar news from IITs. Is it technocrats were never paid salaries that they can boast off ?.News papers and TVs distort it normally displaying Rupee denomination of US salaries, to attract eyeballs on the article. How to quantify "cost of living" ? How to compare salaries in more scientific way ? The purchasing power rate equalizes the purchasing power of different currencies in their home countries for a given basket of goods. Using a PPP basis is arguably more useful when comparing differences in living standards on the whole between nations. This can happen when Govt to protect local industry , to contain inflation etc. Ex : India has a import duty of 100% for automobiles imported in completly assembled form .This is enhance the local price advantage locally assembed/produced automobiles.On the other hand to deflate the ever growing inflation India has banned export of rice varieties other than basmathi. This might be due to demand /supply mismatch. But comparing a basket of goods/services a single factor is arrived at. I tried to google out the official PPP factors for various countries but couldn't find official info on that . I could find the charts showing nominal GDP values and PPP GDP values of varies countries, released by International Monetary Fund IMF . On comparing the these two values for every country we could calculate the PPP of each country.Set of countries which have high immigrant Indian population are chosen and its PPP values are given below. So this quantifies the cost of living comparison across countries. Let us consider Indian Base salary as 10 Lakhs INR for our comparison. This comparison makes sense when you intend to spend the same way in the two countries to maintain a similar lifestyle. If the intention is to save extensively by spending frugally and return to home country in due course ( as most emigrant population does ,) the above comparison makes no sense . Also there are other factors to consider such the tax rates in the working country , how is money brought in India considered etc . Now the comparison makes sense.There less than 1% deviation among the two options and infact the Indian option is marginally better. PS: I dont have practical knowledge of how this works out. If any one has first hand info on comparable salaries in the same company (from intra company transfers ) across different countries , they can validate/invalidate this theory. 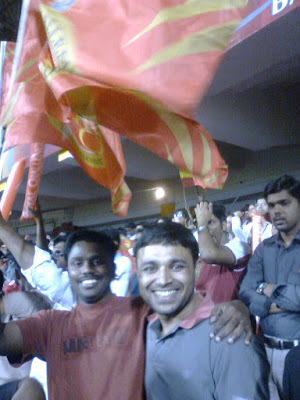 Last week my manager offered to take us to IPL match. 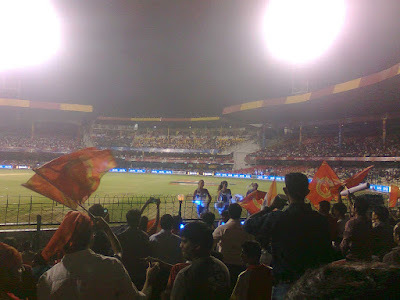 Though i am not a vigilant follower of cricket & so far havn't watched a entire IPL match even in TV, i wanted to experience ground atmosphere. Match was scheduled to start at 8 PM and we started 5:45 PM from our office by walk and reached the stadium in 20 minutes to find already key locations in our gallery has been taken.Ground was almost 50% occupied 2 hours before the match started. 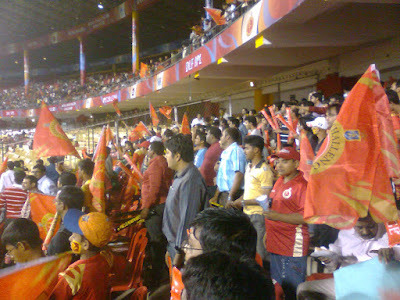 IPL clearly is no more a sport event & more of a entertainment melee. Adrenalin rush in the stadium is comparable to new year eve celebrations in Start Hotel or rock band performing in a college cultural festival.There were huge distractions for the players.Item songs were played even in 1 minute time gap for over change. A DJ was hired to cheer the players & crowd and he did his best to disturb everyone.Cheer leaders placed in strategic locations to cheer the already electrified crowd .As far as the match was concerned , tragically it turnout to be a low scoring game. 93 runs was the target set by Rajasthan Royals which was chased by Royal Challengers in 10 overs without any wicket loss. High viewership has pushed the TV ad rates to astronomical levels . Set MAX sells 10 secs slot for 8-10 Lakhs.Set Max earned 300Cr in IPL1 , 500 Cr in IPL2 & expects 700 Cr in IPL3. Ticket prices ranges from Rs250 to Rs11,000 . I heard there were some Rs40,000 tickets for which exclusive access to players area and dinner with them are arranged. Remember India is country where 27% of people live below poverty line of Rs 21.6 per day ie Rs 7900 per year. What makes Cricket a money minting machine in India ? Cricket is one of few items( infact very very few) where all Indians share same passion.Cricket is followed by people across all income groups , all ethnic groups , age groups and what not. Hence it makes the idle platform for advertising. Single ad with a cricket model can reach the entire country. No other medium can come closer to reach 1,150,000,000 people (1.15 billion .. yea its Indian population ). I feel that Cricket is turning out be another impediment to Indian growth along with other Cs - Corruption ,Caste ism & Cinema. Finance ministry is not a silent spectator .They have introduced clauses in recent budget to levy service tax on these events and on all associated promotions..Service tax of 10% is not sufficient on such events.All we can hope is that Govt considers such events as unnecessary luxurious entertainment and tax them heavily on par with Cinema / Alcohol sales. Intention of this post is to compare the auto fares between Chennai & Bangalore and try to analyze the reason for huge deviation seen among them. I have stayed in both these cities for a fairly long period, 6 years in chennai and 3 years in Bangalore. To my experience traveling by auto is nightmare in chennai,even for localites. Bargain for a distance of say 7 KM used to start at Rs100.We can do nothing but wonder their negotiating capabilities.They quote without fail petrol price hikes ( however old it might be) ,increase in traffic etc and finally make us accept to about Rs80-90 for it.Comparatively in Bangalore you could get a ride for Rs7 per km ( ie Rs49 for 7km).Its even more pathetic for non tamil speakers and floating population who are not aware of city's roadmap.In these cases rates are easily double /triple of the above mentioned ones. Recently during my visit to chennai, i was happy to see a prepaid auto kiosk operated by metropolitan authorities at koyembedu busstand.But on a closer look at the chart,i was shocked.List of places, its distance(in KM) and prepaid charge were mentioned there. Charge were in a multiple of Rs10.5 per KM.Compare this with Rs7 per KM in Bangalore. Officially Auto travel is 50% costlier in chennai than Bangalore !!! 3. Chaotic traffic.Infact if there is a rating for traffic chaos,surely Bangalore will top it ,with its huge no of one-ways. So what makes a same profession 50% more lucrative in Chennai than in Bangalore ? One reason i can think of is wider adoption of auto travel in Bangalore due to pathetic public transport and lack of metro railway.On the other hand Chennai is famous for its well networked bus service and metro rail.Recently Chennai metro was ranked among the World's 10 best commute by forbes magazine .So in chennai people resort to autos only in adverse case of emergency or have a fat purse to spend.This results in lesser no of trips for a auto driver and he is forced to quote high charges,to cover up the constant cost. Due to this abnormal rates people further avoid autos and it results in a vicious cycle affecting both the stakeholder. Basically every business is associated with two costs. Fixed cost and incremental cost.Fixed cost remains constant irrespective of the no of units sold.In this case it should include driver bata ,interest on auto loan etc.Incremental cost is directly proportional to the number of units sold.Here its petrol charge.Eventually each business is left with two options drive up the sales while keeping the margins low ( BigBazzar, Saravana Stores etc) or be a unique vendor quoting premium charges. Here comes the more serious question .In recent times public transport in Bangalore is rapidly getting better with induction of quality buses ,increase in the services and to major extent MetroRail which will be operational soon. So does it sound the end of days for better auto service in Bangalore ? Recently i was invited for the wedding reception of one of my college friend in chennai. I had to travel all the way from Bangalore for this single appointment. But was willing to attend it for the fact that i could meet many of my college friends. Also since the reception was held at one of the best halls in the city ( Mayor Ramanathan Chettiar Hall , RA puram ) near marina beach , i could probably spend some time in the beach too. Truly marina is one of the ever entertaining spots in chennai , irrespective of the fact it doesnt change much . Everything went well .Reception met most my expectations .Wished the couples .Met many of my friends .Had a awesome dinner.Enjoyed breeze at the beach.But to top it all , a surprise awaited towards the end. 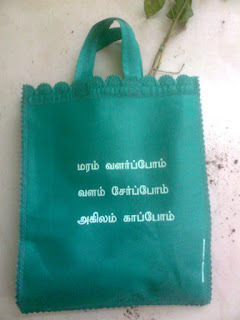 Its a tradition in Tamil Nadu that family of bride & bride groom give a gift pack ( called as thamboolam : தாம்பூலம் ) for all visitors as a token of their thankfulness . This is given when the visitors are about the leave the venue .Traditionally it used to contain a coconut , betel leaves and supari. But nowadays these traditional gifts are overridden by more costlier gifts such stainless steel utensils, sweets etc depending on the economic capabilities of the families involved. 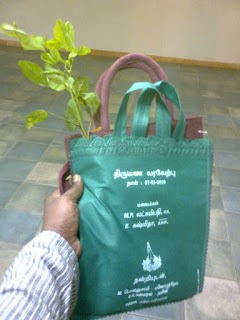 Surprise came in the form of the gift distributed .Couple of bags were given to each visitor. One of them as usual had a stainless steel plate and the other one had couple of saplings and a packet containing few seeds. 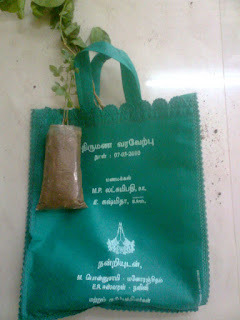 People were interested in collecting the bag with saplings.Since this reception was flamboyant one , i guess there were atleast 1500 visitors . A conservative estimate that 50% of visitors collected this gift and 20% among them show interest in growing these saplings , it turns out to be 300 shrubs or trees (there were 2 saplings in each pack) . Pretty much nice isnt it. Government tries on its part to bring up awareness among people about the need for growing trees. Most of the ambitious plans of the government never comes out of the red tapes of bureaucracy and have never elicited expected responses from common man.I have strong reasons for saying so , as my father works for the horticulture department of TN govt . Have seen grandiose pamphlets from the govt but not much much have realised so far ( at least as far as i know ). But instead of govt , if our near and dear happens to give you a sapling there is certainly a higher probability that we will grow it up. Atleast we will try it. I could hear ( actually overhear) few conversations that if such gifts were given in every marriage ceremonies , chennai will be green soon. Hope these aspirations become true soon ..
PS : I have brought those saplings given to me safely to Bangalore and have placed them in small plastic container . Join me in wishing them to grow well . 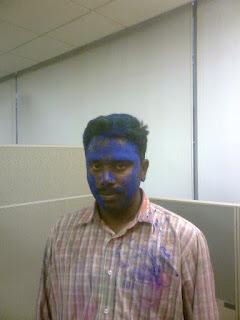 Holi was celebrated in my office . I havnt seen that till yesterday and was curious to know what used to happen .So went there as a silent spectator but was pulled into it .